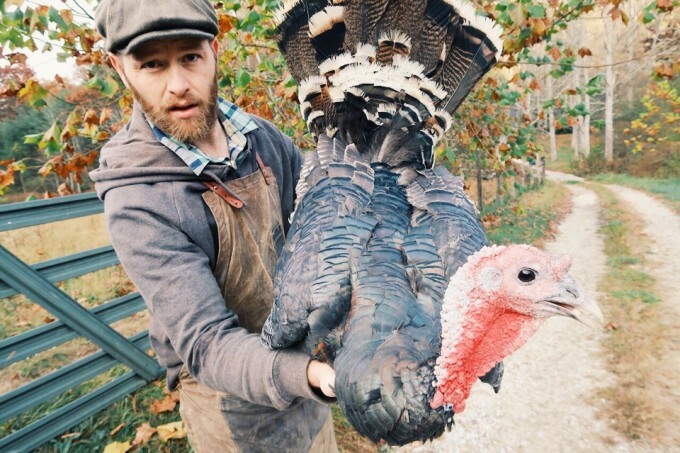 Free range and organic thanksgiving turkeys are crazy hard to come by around here. And, when you do find them, they’re easily $8 or more a pound! So this year we decided to raise our own, and the result was astounding! Not only were we able to successfully raise our own holiday bird, but we can also sell the excess to more than pay for the entire operation. In this article, I’m going to show you plenty of videos of our entire process AND break down our rookie year of success into four easily applicable phases. PHASE #1 – Make a plan. 1st we learned that Turkeys would need higher protein feed and we figured out where we could get it. We went with New Country Organics Turkey Starter from our local farm store. We also learned that we’d need to baby them in a brooder situation so we figured out where we could do that. Then, we made sure we had the right supplies to transition them to grass.Finally, we figured what we’d house them in and made sure we had the supplies and land to move them around on grass on a regular basis. Early in the year, we found our supplier. We went with a hardy heritage breed from a local breeder through the sustainable poultry network. You could also try the Livestock Conservancy, Craigslist or even a hatchery. We ended up with the Bronze Breasted breed and have enjoyed them immensely. We’d buy the poults in early May when they were available and early enough to be ready by Thanksgiving. Phase #2 – The Brooder Stage. For a brooder for 14 Turkeys, we bought the metal 8’X2’ trough at Tractor Supply, and it worked great.We placed the trough in our house hallway at room temperature. We put down 8” of pine shavings and added a little bit daily to keep it fresh. We used a standard heat lamp for 24 hours, but noticed they were pecking at each other. We switched it out with a red heat lamp, and they quit the pecking and seemed to rest better at night. During the day we kept the light on in the hall to simulate daytime. We were told Turkey’s were awful weak during this stage and 30 – 40% of them would die! So, I fed them magic water (½ gallon water, two cloves of minced garlic, two tablespoons Apple Cider Vinegar and ½ cup of honey) for four weeks and kept it clean by elevating it and changing it out regularly. At one point they would jump onto the waterer and poop in it, so I taped a plate over the top to prevent this. I also fermented their turkey starter feed and brought in fresh greens from the yard. After a few weeks, they were able to jump out, so I built a custom cage on top to prevent this. They were relatively quiet unless they were stressed (heat lamp got turned off, out of water or food). We were able to use this small feeder tray and a one-gallon vacuum seal waterer the entire brooding period. Make sure to provide small grit (small rocks) in a little bowl and give them fresh greens everyday, if possible. Oh, and don’t be alarmed at dead looking Turkeys. I mean, these little guys collapse when they sleep! There were several times where we could have swore they were dead. At first, we poked em a bit to be sure but soon realized if we looked closely we could see them breathing. Phase #3 – Transitioning them to grass. Around week six as we transitioned to turkey grower feed and started the transition outside. We’d put them outside during the day in a floorless cage with a shade cloth roof (not too hot and protected from aerial predators). I used cage panels I found in a dumpster, but something could easily be built with wooden frames and poultry wire. To make moving them possible, we just used a cardboard box. Then, we’d move their cage to fresh grass every day. At night while inside we’d leave them in their brooder without a heat lamp. Phase #4 – Grow them to maturity on grass. For my pasture setup, I used premier one electric poultry net and a chicken coop I wasn’t using. One thing I’ll do differently is a design a more airy coop just for the turkeys. A solid roof, and maybe just poultry wire for walls. We always had to herd them in at night. At first, I just tried to let them perch on the roof at night where they wanted to. But they were getting killed by an owl. After they got a little older, I let them try it again, but still, they were getting killed by an owl. We lost three that way. So, we consistently put them in after that and didn’t lose anymore. My children got involved and rounded the turkeys up for the last few months. Gave them an incentive by paying them a share in the sale. I moved them every week or two to fresh grass and noticed they lived primarily off the grass. Totally could have moved them more often to save even more money on feed. All told, it took 15 bags of feed to raise these 10 Turkey. If each turkey averaged 10 pounds. At $34 a bag for organic feed the total cost to feeding one bird comes to $50! Around, here that a crazy good deal for pastured organic turkey. Plus, I could save five for myself, sell the other five and come out even! Now to compare them to chickens. I didn’t lose half of my flock in the beginning like everyone made me think. I’m extremely happy at how well they forage and survive off the grass. Much more than chickens. They bring add a variety of flavor to our family table. Now, I love a scratching chicken for their tilling power, but since a turkey doesn’t scratch they would be better suited to help you mow. Turns out butchering a turkey is MUCH like a chicken. It’s that their carcass is so large it’s easier to get inside to eviscerate. Pound for pound you’re getting more for just about the same effort. Their size was a bit challenging in our chicken sized plucker. The turkeys took much longer to bleed out (six or more minutes compared to two). The turkeys are much stronger, so it’s a bit more difficult to handle them as they can hit you with their wings or poke your eye or scratch you with their legs. I loved it and will totally do this again. The Turkey brings a lot to the homestead with their ability to mow, fertilize, gain weight off of pasture and provide a nice variety of protein for the table. I do hope this guide has encouraged you to get started with turkeys. Download this article (including links to resources mentioned) to grow your own Thanksgiving turkey, HERE.